Chalcedony and Quartz Beaded Necklace on Nylon Cords, "Modern Bohemian in Cream"
In a unique interpretation of bohemian style, Thai artisan Nareerat presents this intriguing necklace. She braids nylon cords in cream and brown, incorporating a delicate silver-plated cable chain in the braid. 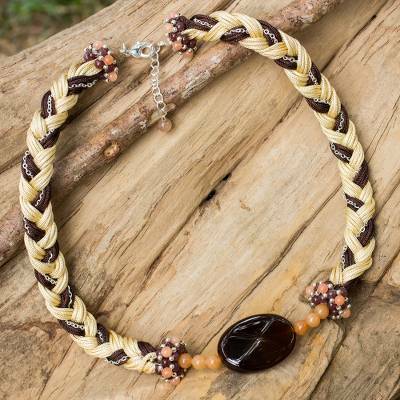 Centering the braided necklace are a dark brown polished chalcedony pendant, dyed quartz beads in shades of peach and pale orange, and tiny silver-plated brass beads. You can find braided pendant necklace 'Modern Bohemian in Cream' by Nareerat in jewelry categories such as Bohemian Necklaces, Birthstone Necklaces, Chalcedony Necklaces, Quartz Necklaces, Nylon Necklaces, Brass Necklaces, Silver Plated Necklaces, Braided Necklaces and Pendant Necklaces. Enjoy exploring these sections for other Novica treasures.